Designed for C2/C3 Equipment. 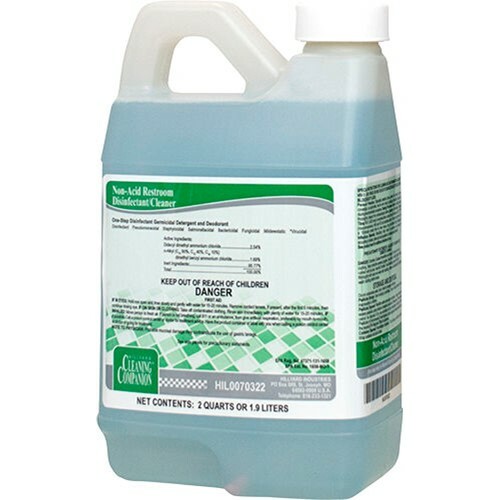 Arsenal Non Acid Restroom Disinfectant and Cleaner is hospital grade disinfectant and detergent cleaner, sanitizer, fungicide, mildewstat, virucide, deodorizer that cleans and controls the hazard of cross contamination from environmental surfaces. Arsenal Non Acid Restroom Disinfectant and Cleaner is designed specifically for use on restroom and shower room floors, walls, countertops, fixtures, and other hard surfaces where disinfecting is a must. It is specially formulated with mild surfactants and a neutral pH to provide gentle, yet effective cleaning. Kills Hepatitis B virus on pre cleaned environmental surfaces. Arsenal products are color coded with large matching numbers on both the concentrated and ready to use container labels for easy mixing and use. Dilution rate 2 oz per gallon.